Texas civil rights lawyer David Richards in the KOOP studios in Austin, Friday, Sept. 14, 2012. Photo by Thorne Dreyer / The Rag Blog. 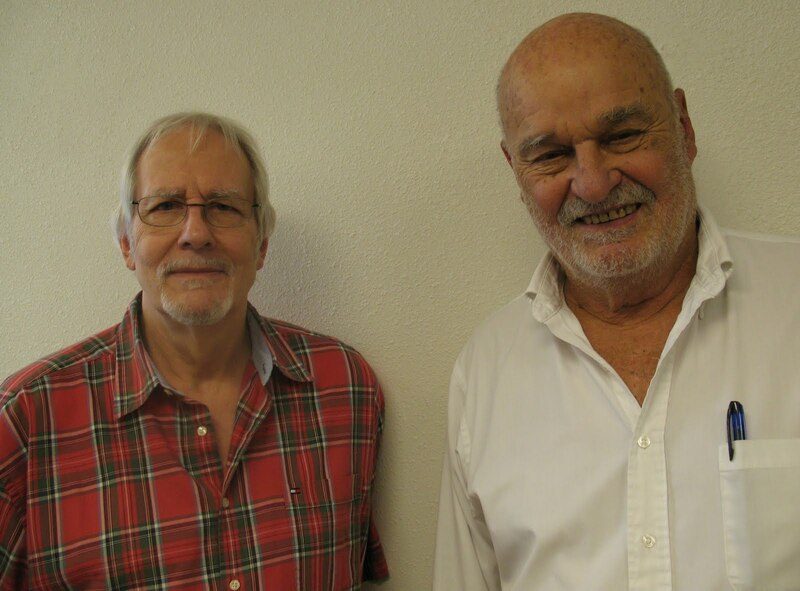 Inset below: Richards, right, with Rag Radio host Thorne Dreyer. Photo by Tracey Schulz / Rag Radio. Texas civil rights and labor lawyer David Richards was Thorne Dreyer's guest on Rag Radio, Friday, September 14, on KOOP 91.7-FM in Austin. Richards, who is the ex-husband of the late Texas Gov. Ann Richards, has argued extensively before the U.S. and Texas Supreme Courts, including a number of historic landmark cases. According to Texas Monthly magazine, Dave Richards "has earned his place in Texas history" as "a rebel-rousing civil-rights lawyer who fought to make Texas just." 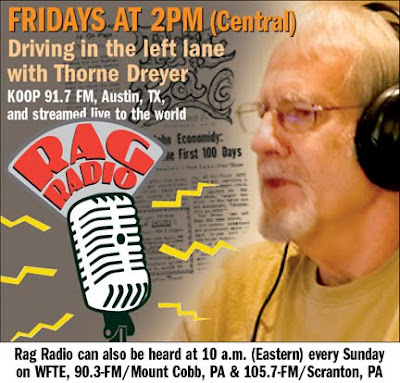 Listen to Thorne Dreyer's Rag Radio interview with David Richards here. On the show we cover Dave Richards' illustrious legal career -- as well as some unique Texas history -- as Richards reflects on some of the most memorable figures in Texas liberal politics including Ann Richards; humorist John Henry Faulk (who was blacklisted by Sen. Joe McCarthy); Judge William Wayne Justice ("the judge who brought justice to Texas"); and Texas Observer founder Frankie Randolph. And the late great folk pundit Molly Ivins, with whom Richards rafted the Grand Canyon just weeks before her death from cancer. Among David Richards' more notable cases were ones that established single member legislative districts in Texas, that declared the Texas obscenity statute unconstitutional, and that overturned the Texas loyalty oath. In 1972, representing the ACLU before the U.S. Supreme Court, Richards won the right for the underground newspaper, The Rag, to be distributed on the University of Texas campus. 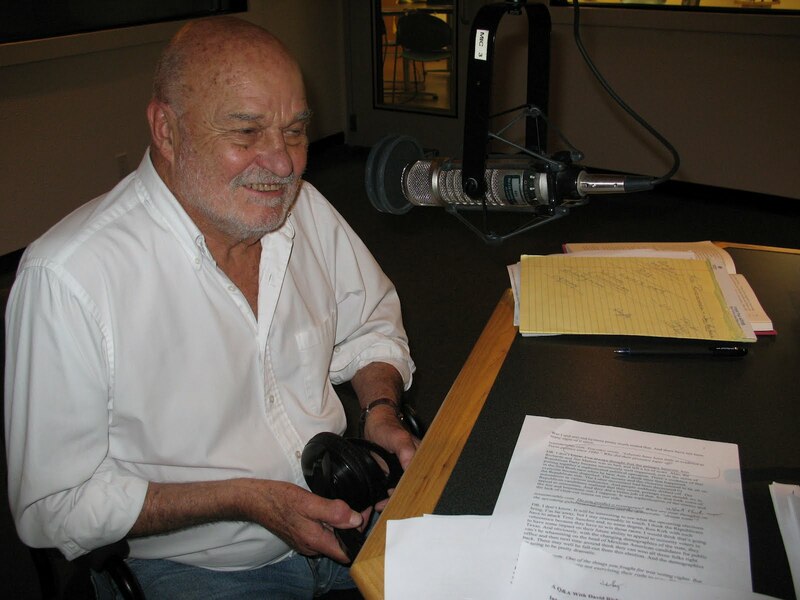 He also sued the Dallas Police on behalf of Stoney Burns, editor of the underground tabloid Dallas Notes, who was busted for obscenity; worked to overturn a vagrancy statute that was used to bust hippies; and sued for the right of students to vote in college communities. David Richards has also been an adjunct professor of law at the University of Texas Law School; served as an attorney with the U.S. Commission on Civil Rights; was Executive Assistant Attorney General of Texas; and was General Counsel for the Texas AFL-CIO. Richards is the author of Once Upon a Time in Texas: A Liberal in the Lone Star State. THIS FRIDAY, September 21, 2012: Singer-Songwriters Bob Cheevers and Noëlle Hampton & Andre Moran. September 28, 2012: Composer, Musician, Conductor, Writer, and Scholar David Amram.